NOLA pal Blake Boyd has opened a gallery and I'm in the inaugural show! My New Orleans buddy Blake Boyd—puckish artist & performer—has opened a gallery on Julia Street along with his paramour Ginette Bone. The Boyd Satellite Gallery (“BS” for short!) inaugural show has been curated by Hollywood actor Blake HOWARD Boyd, and it is in honor of our own Blake NELSON Boyd. Entitled Megalomania, it features work by such esteemed creators as Andres Serrano, Billy Name, Dave Eggers, Al Jaffee, and Steve Martin. And I have a piece in there, too, a pen-and-ink portrait of Blake in homage to his Louisiana Cereal Polaroid portrait project. The show opened on Saturday (I was sad to miss it) and has already gotten some nice coverage from the Times-Picayune and NOLA Defender. Should you be in NOLA for the next few months (the show will be up til mid-February), be sure to check out the show. The final component of the Rubin Museum‘s “Karma-Con” approaches. This Wednesday, April 18, the Rubin will unveil the finished illustrations of the “Cartoonists’ Wheel of Life.” After interacting with the art that inspires us, discussing the significance and merit of the Wheel of Life as an artistic image, working collaboratively in an open studio setting and individually in our own studios, artists Molly Crabapple, Sanya Glisic, Ben Granoff, Rodney Greenblat, Steven Guarnaccia, Michael Kupperman, Katie Skelly, and myself unveil our completed works as a unified Wheel of Life. A careful viewer will see examples of all these sufferings in my image, as well as allusions to the Occupy Wall Street movement (and a sneaky self-portrait of the artist). The evening includes a Himalayan happy hour & spiral music, a pre-program tour of the Wheel of Life and second floor galleries, the unveiling of the new Wheel of Life and a discussion with the artists moderated by comics historian Christopher Irving, and a post-program tour of the accompanying exhibit Hero, Villain, Yeti: Tibet in Comics. And did I mention the whole evening is free?! See below for a sneak-peek at my section from when it was in progress. And check out the Rubin’s page on the event for the full details. Atlantic Center for the Arts "Master Artist"
Last summer I was approached by the ACA to be a “master artist” for their 2012 graphic novel residency, taking place this October 8–28. I was honored to be asked, and excited to accept! During the three-week residency I will be working with eight associate artists on their long-form nonfiction comics projects. As part of the residency, we’ll be spending two hours a day together, conducting workshops, talking about the challenges we face, and working in a studio setting. I haven’t done a lot of teaching up ’til now (though Sari and I will be co-teaching a comics writing class this summer at the Fine Arts Work Center in Provincetown), but I’m very comfortable in workshop environments. I look forward to working with my associate artists as we explore the best ways to make their ideas come to life. My residency will be in conjunction with those of two other “master artists,” Megan Kelso and Ellen Forney. I’m particularly excited to be sharing the experience with Megan and Ellen, both of whom I admire tremendously. I look forward to communing with them both, and hope there will be opportunities to merge our three groups for various activities. A happy coincidence about this opportunity is that, unbeknownst to the ACA, my mother, Martha Rosler, was a Master Artist there back in 2002! It’s a kick for me to be linked with my mom in such a way. If you’re interested in applying to be an associate artist, or know someone who would, please check out the ACA website for further details. There are descriptions of Megan, Ellen, and my residencies, an FAQ, and lots more information. The application deadline is May 18, 2012. I was all sent last month to lead a talk at the Rubin Museum when I suffered an untimely injury. I dislocated my kneecap and ruptured my patella tendon playing basketball, and had to have surgery. After being laid up in the hospital for four days, I’m now back home, but am sporting a full-leg fiberglass cast on my left leg (which I’ll have to endure until at least March 30). But that won’t stop me from going through with my planned talk! This Friday, March 16, we’ll try again. In conjunction with the current exhibition, Gateway to Himalayan Art, I’ll pick out a few pieces from the show that strike me or form some connection with my own practice. And I’ll be accompanied during the event by assistant curator Beth Citron—as I mentioned before, someone actually qualified to discuss South Asian art. I should be able to hobble through this without too much trouble. Friday, March 16, 2012, 6:15pm — FREE! The “Artist on Art” series is part of the Museum’s self-styled “Karma-Con.” Part two, the “Studio Salon,” takes place the following Wednesday, March 21. For that event, myself and a group of other local cartoonists/illustrators will reinterpret segments of the Tibetan Wheel of Life (also known as the Wheel of Becoming, a representation of Buddhist beliefs about life, death, and rebirth). Molly Crabapple, Ben Granoff, Michael Kupperman, Katie Skelly, and I will create initial sketches, sell and sign our work, and share our creative processes in an open studio setting, complete with cocktails. This event is specifically tied to another Rubin exhibition, Hero, Villain, Yeti: Tibet in Comics. I should be able to prop myself up somewhere, leg sticking out awkwardly, to do some preliminary sketching. Karma-Con part 3, “The Unveiling,” will take place April 18; further details to come. By then I should be completely able-bodied again! DUE TO MY DISLOCATED KNEECAP AND RUPTURED PATELLA TENDON INJURY, THIS EVENT HAS BEEN RESCHEDULED FOR MARCH 16. See you then. On Friday, February 24, I’ll be leading a free “Artists on Art” talk at New York City’s very own Rubin Museum. In conjunction with the current exhibition, Gateway to Himalayan Art, I’ll pick out a few pieces from the show that strike me or form some connection with my own practice. I’ll be accompanied by assistant curator Beth Citron—e.g., someone actually qualified to discuss South Asian art! This is part of a series sponsored by the Rubin, where “speakers from New York and international contemporary art scenes interact with and informally discuss the rich artistic traditions of the Himalayas and surrounding regions in relation to their own practices and processes.” I visited the museum—which is only about seven years old—for the first time last week, and found it a really impressive and beautiful venue. The Museum is currently exhibiting another show, Hero, Villain, Yeti: Tibet in Comics, and I’ll also be participating in a project centered around that. The subject is especially close to my heart because of my affection for Hergé’s Tintin in Tibet, which I’ve long considered the best of the Tintin adventures. Anyway, along with 7 other graphic artists, I will take part in an “Open Studio” (held at the museum) where we will produce an interpretive graphic version of the Tibetan Wheel of Life (also known as the Wheel of Becoming, a representation of Buddhist beliefs about life, death, and rebirth). This open studio (where I’ll be conceiving and doing preliminary work on my section of the Wheel) will take place March 21; further details to come. 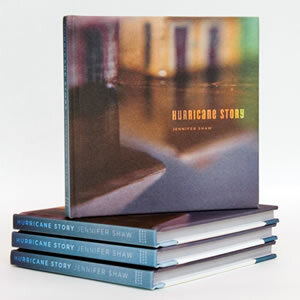 I strongly encourage you to get a copy of Hurricane Story, the beautiful cloth-bound art book by New Orleans-based photographer Jennifer Shaw. Just out this month from Broken Levee Books (an imprint of Chin Music Press), the slim 7″ x 7″ volume boasts an eloquent foreword by my old buddy/collaborator Rob Walker. Jennifer Shaw was nine months pregnant when Hurricane Katrina blew into the Gulf. In the early hours of August 28, 2005, she and her husband loaded up their truck with their two dogs, two cats, photo negatives, important papers, and a few changes of clothes. They evacuated to a motel in southern Alabama and tried to avoid watching the news. Monday, August 29, brought two life-changing events: the destruction of New Orleans and the birth of a son. Using a simple Holga camera, Shaw narrates her six thousand-mile journey with dreamy and haunting photographs of toys that illustrate her emotional state during a time of exile, waiting, and eventual homecoming. Hurricane Story is a fairytale of birth and death, joy and sadness, innocence and infinite despair. Through the unexpected device of the Holga camera and the toy dioramas, all the familiar images of the Katrina story are brought back to vivid life, reminding even the most jaded reader of what it felt like to live through those dark days. The book’s beautifully staged tableaux are alternately sweet and menacing, filled with emotion but never spilling over into sentimentality. The book is highly personal yet somehow universal, mournful yet playful, striking a balance which to me seems perfectly New Orleanian. The poetic marriage of words and photos makes Hurricane Story a children’s book — or, if you will, a “graphic novel” — for grown-ups. For links to purchasing a copy, click here. 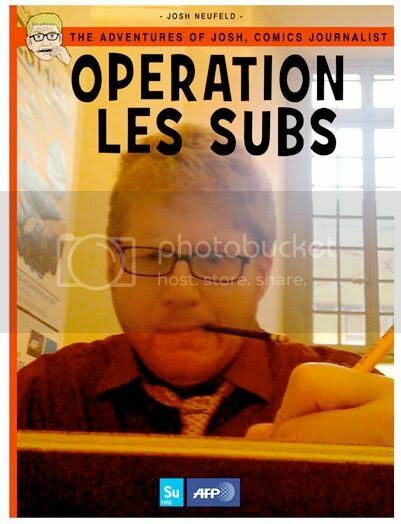 Now up on ACT-I-VATE: "Operation Les Subs"
I'm back home from Lyon and still processing the incredibly, energizing experience of Les Subsistances' "Points de vue, Nouvelles du monde" festival. Today I'm posting the photo comic which served as the introduction to each of my nightly performances. I produced the photocomic in the two days (June 21 –June 22) leading up to the festival. It's a satirical look at the "journaliste BD"'s process of producing a daily comic on the news. (This is an English version — the original is in French.) The beautiful and talented Sari Wilson took the photos. Once the 120 members of the audience had entered and were seated, the photo comic was projected on a screen, accompanied by a soundtrack. I was waiting in the wings, out of view. Right as the last image came on the screen, I burst into the room (to some applause! ), and distributed copies of the day's comic to the crowd. Then (with the help of a translator) I presented the comic on the projector as the audience followed along. I've set this up so it's Chapter 1 of the "Points de vue" comic. 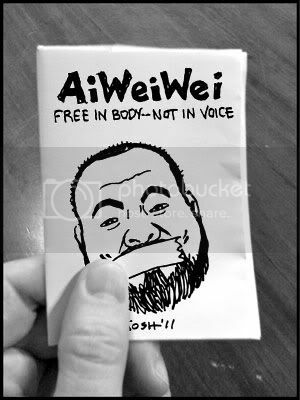 Chapter 2 is my first 8-page mini-mini, on Chinese dissident artist Ai Wei Wei. Chapter 3 is the 8-pager I did on Friday, on the exorbitant fines being handed out to bloggers in Taiwan. 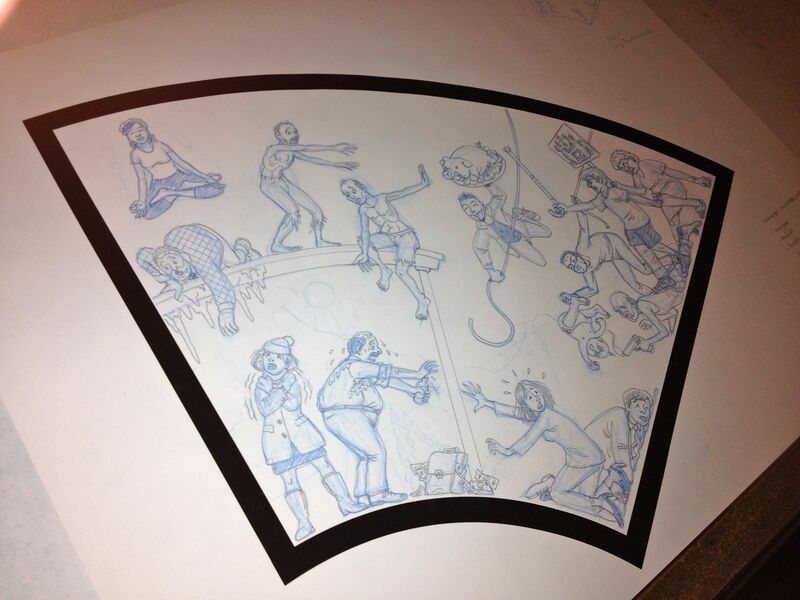 Tomorrow, I'll post Chapter 4, the 8-page comic I did on Saturday, the festival's final day. Now up on ACT-I-VATE, "Ai Weiwei: Free in Body, not in Voice"
Today is the final day of Les Subsistances‘ "Points de vue, Nouvelles du monde" festival. It’s been a thrilling — and exhausting — journey. I’ve really enjoyed mixing with the rest of the participants: Congolese dancer Faustin Linyekula, French experimental theatre company Hauts & Court, Italian theatre troupe Compagny Motus, American radio producer Benjamen Walker, French anthropologist & writer Eric Chauvier, and Haitian-Candian writer Dany Laferrière. In the two days leading up to the festival, Sari & shot and put together a satirical fumetti (photo comic) about my process as a "journaliste BD." And then each day I researched, wrote, drew, and assembled an eight-page mini-comic in response to a news event of the day. For the first day of the festival (Thursday, June 23, 2011) I chose a story about Chinese dissident artist Ai Weiwei and his release that day from prison. I just had my portrait taken by New Orleans visual artist Blake Boyd. He and his partner Ginette Bone drove up from NOLA (whew! that’s no joke of a drive!) for an event, and while they were in town they swung by my place to snap my mug. The portrait was for a documentary art project, a series of personalities significant in their contribution to the diverse culture of New Orleans pre- and post- Hurricane Katrina. Blake started the project as a response to the devastation following the storm, hoping to present the vitality of the community rather than its near destruction. Born and raised in New Orleans, Blake seeks to reveal the essence of the Crescent City’s culture through the documentation of individuals recognized and associated with the city’s unique spirit. I’m honored to be included in that list, which features a range of first responders and local celebrities — Allen Toussaint, Brad Pitt, Kermit Ruffins, Susan Spicer, Irma Thomas, Dr. John, Leah Chase — as well as representatives of local icons like Cafe du Monde, Mother’s Restaurant, New Orleans Saints players, and St. Augustine’s Marching Band. I was amazed at how quick and painless the whole process was. Blake brought along a portable backdrop, and we took the photos on the stoop of my apartment building in natural light. He uses one of those cool old Polaroid cameras that produce super-high-resolution photos suitable for poster-sized prints. 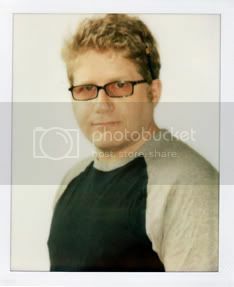 As you can see from the attached samples, each image is shot the same, head and shoulders only against a white backdrop.